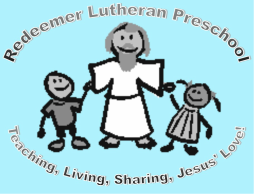 Exploring, Discovering, Creating, Imagining, Playing, Learning….all of these words are words that we hope to incorporate into each day that your child spends at Redeemer Lutheran Preschool. This year I will be trying a new adventure....teaching the Tuesday/Thursday 3's class. So a quick intro seems important.... I have been married to my favorite guy Tom for 22 years, and we have two beautiful kids Madison(20), and Will(18). We have lived in Willmar for all of our married life, and enjoy the lakes, motorcycling, and just generally traveling. You will all get to meet Maddie as she will be teaching with us this year at Redeemer. Each day at preschool is spent carrying out the best way possible to make school fun and alive! Jesus is an intricate part of each day. We love spending time learning about his life and how we can become more and more like him every day! Psalm 32:8 says---"I will instruct you and teach you in the way you should go; I will counsel you with my eye upon you." As I strive to learn more about Jesus myself, I try and instill that love to each of these kids. School is just racing along. These past months we have been talking about God's Creation, Adam and Eve, Noah, Abraham, Sarah, Issac, and Jacob and Easu.... Coming up we will be talking about Moses, Angels ,& Jesus..... be sure to ask the kids what they are learning about. The kids are all settling into the routines of school. And I just love that, and the time that we get to spend together. We have so many fun events coming up, so make sure to watch the calendars to keep up.